KakaoBank launched ‘group account’ service, which combines SNS and financial products’, on the 3rd. On this day, KakaoBank held a press conference at KakaoBank Seoul Office to commemorate group account service. “Biggest strengths of group account are its abilities to check my accounts and group account at the same time and their balances.” said Director Lee Byung-soo of KakaoBank’s Group Account Task Force. By choosing native application method rather than hybrid application method, group account allows its users to check balances in real-time even when there is huge amount of traffic around inquiry function. KakaoBank has also enhanced accessibility and level of convenience by linking group account to KakaoTalk. Owner of a group account can either convert their KakaoBank accounts into group accounts or open new accounts and use them as group accounts. They can send invitations within their corresponding chatrooms and invite members to become part of group accounts. One can invite up to 50 people. If a person wants to invite more than 50 people, he or she can invite people by separating them into different groups up to 50 people. Up to 100 people can become members of one group account. There is no Won limit. Members who are at least 14 years old can use group account service even without opening up KakaoBank accounts. If they join as KakaoBank members, they can check history of how fees were used within group accounts. People without accounts can wire transfer through different applications. Owner of a group account can check current status of fees and send reminder messages to members who have yet to pay fees through KakaoTalk. Interest rate is identical to that of KakaoBank’s bank account (2.10% biannual maturity, 2.50% one-year maturity). Excess fund from fees can be stored into KakaoBank’s safe box. However, group account service cannot be used for emergency loans and credit line, accounts to pay for KakaoBank’s loan interest and principal, cancelled and dormant accounts, and accounts with reported incidents. Owner of a group account has the rights to fee payment and cancellation of a corresponding group account. He or she can cancel a group account after removing corresponding members. Although owners of group accounts have many rights, embezzlement can be prevented since members also have rights to inquire history. 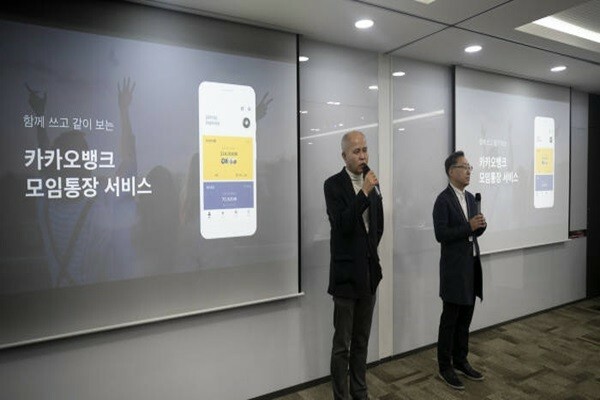 “Because members can check balances and flow of funds, they can quickly find out if there is any hint of abuse of money.” said Director Lee Byung-soo.